Why do most people drop out of an exercise program? Well there are a lot of reasons. Not very good ones but a lot of them. Most people know that exercise is good for you. It will improve your health, your quality of life and even your lifespan. The major problem with decision making is that if it was rational then exercise adherence would not be a problem. Many people say they just don’t have the time. Many people travel for work. Work or child care responsibilities take a priority. They had to give up something more enjoyable to work out. 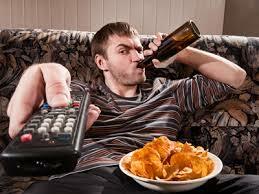 Exactly, why workout when you can watch reruns drink beer and eat chips. Some say they got bored with their exercise program. They are afraid of getting hurt. It is very true. And most people know it, so what is the problem with getting people to exercise and eat properly? over half of the population is overweight or obese. If you are thin or of a normal weight you are the odd person out. I don’t buy excuses, but I do understand how hard to could be to get into the exercise habit. I try to help I help people get better self management skills so they are able to achieve their goals. If someone else can do it why can’t you? Why can’t anyone Many of the most successful and busy people in the world make time for exercise. If they can find the time anyone can. But there is nothing stopping you from taking a walk around the block. It is easy, free and great exercise. Something is always better than nothing, and you can build on it. Adding more, going longer or complementing it with other forms of exercise. What other reasons have you heard of that people use to drop out of an exercise program? Write then in the comment section below and lets see if we can find a way to help these people overcome their objections and keep them motivated. This entry was tagged exercise adherence. Bookmark the permalink.